Most network printers or wireless printers don’t need additional setup. Windows is smart enough to find those printers (as long as the printers are turned on) and install the network or wireless printer for you. From the Start button menu, choose Settings. Click the Add a Printer or Scanner button. 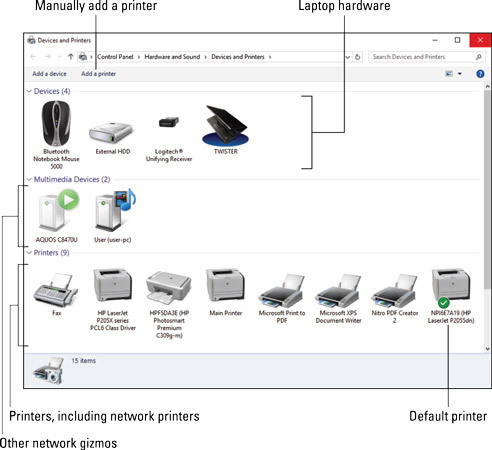 Click the Devices and Printers link, found below the list of printers on the Devices screen. The creaky old Control Panel opens, displaying the Devices and Printers window. It lists all physical devices connected to your laptop, including a list of network printers. The Devices and Printers window. Click the Add a Printer button. The Add a Device Wizard starts, scanning known network territory for a printer. Choose the printer from the list, and then click the Next button. You don’t have to wait for the wizard to stop searching; the second you see the printer you want to add, click the Next button. At this point, your job is mostly to click the Next button until that button becomes the Finish button, in which case you’re done installing the printer. If the printer you’re looking for still isn’t found after completing these steps (or just getting to Step 5), consult its documentation. You might have to install special software first and then add the printer.